Samurai sudoku puzzle categorized as easy, as far a this extension of the original sudoku puzzles go! 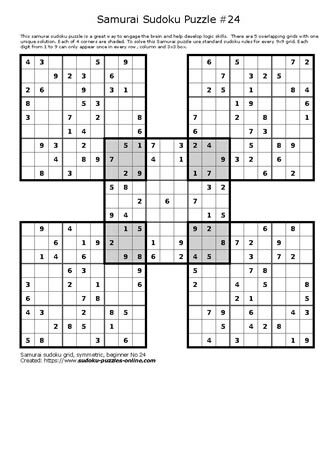 There are 5 interlaced 9x9 sudoku grids and to solve the brain teaser, apply basic sudoku rules. Challenge family and friends to see who can be the first one to complete the puzzle. Or, work in teams to see which team can finish the puzzle first. Use puzzles to make time fly when you are traveling long distances. Puzzles support brain health and samuari sudoku puzzles are a great addition to your puzzle collection.